Magliner is the world leader in the manufacturing of route distribution solutions. Handtrucks2go.com is proud to bring you the most popular of the Magline products line. Our partnership with Magline is a testament of our commitment to bring you only the best products available on the Market! 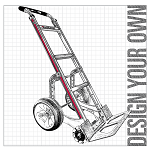 Design your Own Hand Truck with Numerous Combinations and Possibilities! Magliner LiftPlus Lite Electric Stacker Hand Truck - 33"
Magliner Liftplus Electric Stacker Hand Truck - 60"
Best Prices and Always On sale!